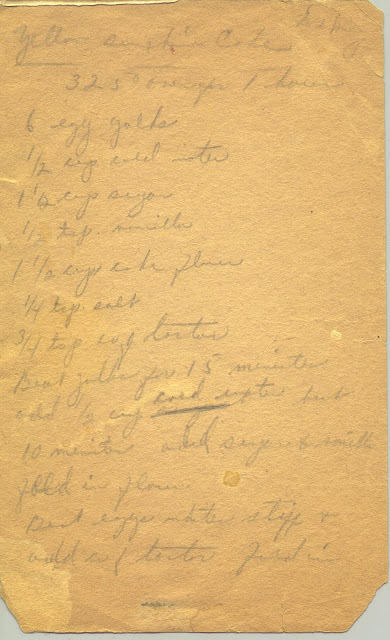 A blog about baking using recipes handed down from my grandmother, most of which are handwritten by either her or her friends/relatives. It highlights my experiences with testing - and tasting! - the various recipes, problems I encounter, and variations I incorporate. I interject with memories about my grandmother, Grace, and my family. I would like to print this blog as a cookbook to be sold as a fundraiser for the United Mitochondrial Disease Foundation. If you are looking to make a very traditional layer cake with homemade buttercream frosting, this is the recipe for you! The cake is interesting because it requires no "oleo". The fluffy batter made from whipped egg yolks and egg whites yields a very light, drier cake that, when drenched in buttercream, has a wedding cake flavor and consistency. The recipe indicates a bake time of 1 hour at 325 degrees, but the size and type of pan is not listed. I split the batter into three 8-9" rounds only to find that the bake time was reduced to about 20-30 min. I am being intentionally vague because my oven is possessed. If it is set at 350 the temp goes up to 400. If it is set at 325 it goes down to 300. So I watched the cakes like a hawk and they still ended up a bit overdone but still delicious. What I am saying is that you may wish to experiment with the actual baking pan(s), temp, and time. Good luck! 1/2 c. cold water - add to beaten egg yolks and beat 10 more min. For the buttercream frosting I followed the directions on the bag of confectionary sugar. I will say it involved 2 c. of butter and 7 c. of confectionary sugar, some vanilla and milk. Enjoy! GOOD GRIEF! NO WONDER I FEEL LIKE A LUMP OF LARD TODAY!!!! 2 CUPS OF BUTTER!!!!! but ohhhhhhhh so delish! better than the ultimate cake at wegs.....keep on baking heather! can't wait for the next confection! January 2011. Simple theme. Theme images by luoman. Powered by Blogger.